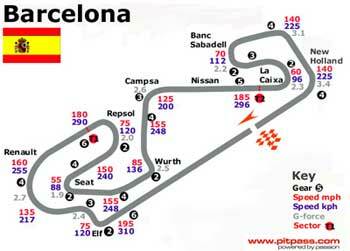 The travelling circus goes to Barcelona in Spain for the fifth round of the championship. Last year there were great moans because the Ferraris scooped the pool, but that certainly is not the case this year, with four different winners from four races so far. They are Raikkonen and Coulthard in the McLarens, Fisichella in the Jordan and Michael Schumacher in the Ferrari. Quite frankly, it is anyone’s championship at this stage. McLaren has got their drivers up there through consistency, Williams have to break through soon, and Ferrari has just been unlucky for the most part. The race should be televised here at 7 p.m. local time, but as always, check your own TV guide! The "new" names at the pointy end have been Alonso (Renault) and Webber (Jaguar). I predict good things for both of these young drivers, though hopefully, Alonso will have learned what the waved yellow flags are supposed to mean! What did we learn from the San Marino GP two weeks ago? Well, we learned that the Schumacher brothers are true professionals, both racing despite the accidental death of their mother in the early hours after qualifying. Ralf’s performance in the early part of the race while leading big brother Michael was particularly scintillating. We also learned that perhaps Fisichella’s win in Brazil was a case of the field being tightened up by five Safety Car periods and being in the right place at the right time, because he was certainly not on the pace at Imola. Jaguar’s woes continued, with both the green cats having problems getting off the line, and despite Webber’s best efforts, they all came to nought with another drive shaft failure. Pizzonia continues to be less than impressive, and the rumours abound that Jaguar may finish his contract early. However, until they have two cars that will get to the finish flag, it would appear to me to be a little hasty. Raikkonen continues to impress, and deserves his current top spot on the ratings. 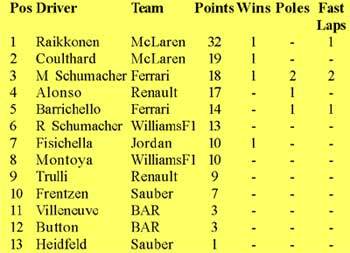 Coulthard, on the other hand, has managed to get to second spot without having passed a single car in four races. He even admitted after his solitary win this year that he hadn’t actually passed anyone. How many G’s do you get when you hit a wall? Lots! When Fernando Alonso clobbered the wall at the Brazilian GP, he hit the wall with an impact of 35 G, followed by a second impact of 60 G.
Taken from readouts from the Renault’s electronics, after a relatively light impact with Mark Webber’s Jaguar’s wheel lying on the circuit, of around 4.5 G, the accident data recorder indicated the first impact with the wall was a 35 G lateral and 35 G longitudinal impact, followed by a second side impact of 60 G.
If you think that’s a fairly rapid rate of deceleration, it is nothing compared to that which was encountered by David Purley when he crashed during practice for the 1977 British GP. His car went from 170 kph to zero in 0.66m - that’s about 22 inches in the old money - experiencing G forces of 180, the highest ever impact that a human being has encountered and survived, earning a place in the Guinness Book of Records, by a rather hard way. Having cheated death on the ground, he was not so lucky in the air. In 1985 he was killed whilst flying his stunt plane off the Bognor Regis coast. You win some, you lose some! Having mentioned Alonso twice this week, we might as well look a little further at his career to date. Like most Eff Wun racers, he began in karts, but Alonso started when he was three years old! By the age of twelve he was Spain’s Junior Karting Champion, a title he held for four years in addition to winning the World Junior Kart Championship in 1996 at the age of 15. Progressing to Inter-A Karting, Fernando won the Spanish (twice) and Italian titles before progressing to single-seaters, the Euro-Open Movistar Nissan Championship, which he won at the first attempt, winning 6 races and starting from pole on 9 occasions. The following season, he graduated to F3000, finishing second in Hungary and first in Belgium, finishing fourth in the championship behind another F1 graduate, Mark Webber. In 2001, he ran for Minardi making his F1 debut on March 4 at Melbourne, becoming the third youngest driver to start an F1 Grand Prix. 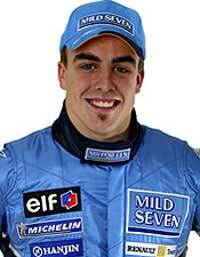 For 2002 Fernando returned to Benetton (now called Renault) as test driver, and replaced Jenson Button for this year. 2003 has been a good year so far, and he has certainly made the F1 circus sit up and take notice. FoMoCo has indicated that they are thinking ahead, and are prepared to use the best in its stable as a basis for the new bunch of Fords. Using their stake in Mazda, they are going to appropriate the Mazda 6 to be the vehicle platform for up to 10 new vehicles from Ford Division, Lincoln and Mercury. First of these will be the Ford Futura in 2005. The Mazda 6, a mid-sized sedan which was introduced last year by Ford affiliate Mazda Motor Corp, and is unfortunately not sold in Thailand, but has received rave reviews all over the world. The thinking is obviously that if they have stumbled on a ‘good thing’ they should make the most of it. The new vehicles will fill many holes in Ford Motor’s product line-up, giving more substance to CEO Bill Ford’s promise of a turnaround produced by new products. According to sources in America, Ford’s challenge is to make distinctive vehicles for all three brands, particularly Lincoln, from the Mazda hardware. FoMoCo say they chose the Mazda 6 in part because the platform can be lengthened and widened, and they can us as much as 65 percent of Mazda 6 parts in the new vehicles. Another reason could be the fact that the Mazda 6 already was in North America, having gone into production last year at a joint-venture plant in Flat Rock, Michigan. Where do you go for service? 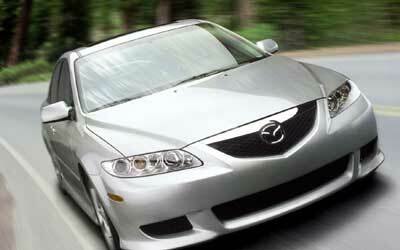 One of the perennial cries, anywhere in the world, is "Where can I get my car serviced/repaired?" This item was prompted by a letter I received last week from the north, asking just that. "I now live in Chiang Mai and am considering buying a pre-used Jaguar. I know of several shops in Bangkok that specialize in Jaguars. Do you know if there is a shop in Chiang Mai that has a mechanic that specializes in Jaguars? Thanks, in anticipation of your advice." This is definitely not just a Thailand problem, however. In fact, the major carmakers have all now begun to understand that customer loyalty (read - will buy another car from us next time) depends on the quality of service they get for their current vehicle, just as much as whether the current car is reliable. With today’s vehicles, which are all reasonably well screwed together, the reliability factor becomes less and less. And when you remember that your "ABC" branded vehicle was actually built by "XYZ" car company (a quick example - the Subaru Traviq in Japan is actually a re-badged Chevrolet Zafira built in Thailand, which is actually originally the European Opel design). Some of the manufacturers have begun dealer accreditation programmes to improve customer service and satisfaction, with Mazda Sales (Thailand) Managing Director David Grakul being reported last month in Thai Autobiz as saying, "On the after sales service, we’ve got the Quality Service Programme. 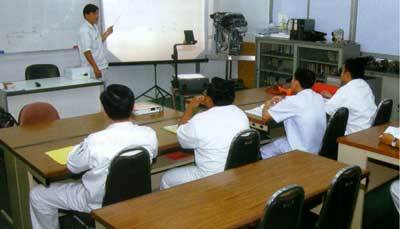 It’s a very structured programme that was developed by Mazda in Japan. What it involves is getting the customer service people to spend 6-9 months in the dealership; training service advisors, training technicians ... and making sure the technicians and service advisors are very proficient on the latest diagnostic tools that we have. It’s an intense programme that we have expanded into fifteen dealerships." That type of training within the dealerships is also being done by BMW, Ford, GM, Toyota and Honda - but with varying degrees of success. I also heard last week of someone who went into a major Japanese dealership to ask about a new car and the sales person couldn’t even give the prospect a brochure to look at, but did know the prices of the models! Customer satisfaction? Zero, and zero sales also. He went to the opposition and bought there. However, getting back to the gentleman with the Jaguar problem in the north - can anyone in Chiang Mai, with a Jaguar, suggest anywhere for the gentleman to go? You can contact me through the automania email address and I shall pass it on. For those of you in the Eastern Seaboard area, I can recommend CMS, a general garage, run by Martin, a Swiss-German (but speaks good English). He has a towing service too and does stand behind his mechanical work. I have also found him to be very obliging. He understands customer service! He is on Sukhumvit Road between Jomtien and the Ambassador City, telephone 038 233 368 (after 10 a.m.). Last week I mentioned that I spotted what I think was a Fiat 508 circa 1937, complete with a ‘leopard skin’ bonnet cover in Chiang Mai. The Fiat 508s were sold in France under another name, and I asked what was it? The answer was the Simca Huit. And so to this week. The concept of hybrid cars is all the rage at present, with petrol-electric engines returning amazing fuel economy figures. However, this is nothing new. In 1900, a racing version vehicle with this type of propulsion, complete with the designer at the wheel, won the Semmering hill climb. The petrol engine turned a dynamo that produced electricity to drive the two electric motors. The question is - what was the name of this car?